State Budgetary Healthcare Organisation “Clinical Oncology Dispensary No.1” under the Ministry of Healthcare of Krasnodar region (SBHI COD №1) is a specialised medical institution, which provides a full range of medical care to the patients with malignant tumors (neoplasms) of various localisation. The main areas of work comprise early detection, diagnostics, preventive measures, treatment of malignant tumors and precancerous diseases, rehabilitation of cancer patients. Currently, the clinic operates 845 beds: 8 oncology departments (Mammology, Gastroenterology, Urology, Head and Neck Tumors, Gynecology, Proctology, General Oncology, Soft Tissue), 2 chemotherapy departments, 3 radiology departments (General radiology, Radiogynecology Department, Outpatient radiology) and Hematology Department, Medical Outpatient Department, diagnostic services, etc. Thanks to active and comprehensive support of the local authorities and the Ministry of Healthcare of Krasnodar region SBHI COD No.1 is permanently developing. Innovative methods of treatment are introduced in practice, and nowadays the dispensary owns everything necessary to provide high-technology medical care, such as modern equipment, up-to-date medication and human resources. Totally, the dispensary employs about 300 doctors, including 6 Grand PhD, Med., 34 PhD, Med, 7 doctors are awarded with the title of "Honoured Health Worker of the Kuban". Doctors of the dispensary are constantly improving their professional skills: they take part in major international and local conferences, congresses, symposia and master classes, undergo training in central clinics of Russia and Europe, publish articles in local and foreign scientific serials. SBHI COD No.1 performs reconstructive, extended, combined operations including the usage of laparoscopic technology. Methods of conservative surgery for kidney, bladder and early stage breast cancer are widely used in the dispensary. A single-stage breast mammoplasty is also performed after its complete removal. Oncologists of SBHI COD No.1 use intraoperative radiotherapy using INTRABEAM PRS 500. The oncogenetic laboratory has been working effectively within 7 years. Since 2014 the da Vinci Si Surgical System is being applied for oncogynecological, oncourological and oncoproctological operations. More than 350 minimally invasive operations have been successfully performed. This surgical technology of minimally invasive interventions is currently the most advanced in the field of endoscopic surgery. Miniature robotic instruments have seven degrees of freedom of movement, which allows to perform manipulations as accurately as possible without damaging the nerve branches and vessels. During the operation doctor receives a 3D image of the surgical field with multiple magnification. The surgeon controls Robot da Vinci with the help of special manipulators, transmitting the slightest movement of his fingers. Robotic system da Vinci helps to perform complex operations of tumor removal in areas beyond reach of the surgeon's hands – in fact, it is conducted through punctures on the skin with minimal blood loss and tissue trauma, which significantly reduces the postoperative and recovery periods. All oncologists operating on the robotic complex are highly qualified professionals, having been trained in leading Russian and foreign medical centres and have the appropriate certificates confirming their level of qualification. Our experience in the usage of the da Vinci Surgical System allows us to assert that it is possible to perform oncological operations, combining minimal trauma and oncological radicality of surgical intervention with preservation of innervation and function of organs and providing high level of "quality of life" for patients after surgery. SBHI COD No.1 is also rapidly developing telemedicine technologies using them in everyday practice. Therefore the oncology dispensary has become one of the first medical institutions of the region, where large-scale video conferences are regularly held. For instance, the best specialists in the field of oncology from the leading clinics of the country, and since 2012 from Europe, conduct their exclusive master classes in the walls of the medical center. 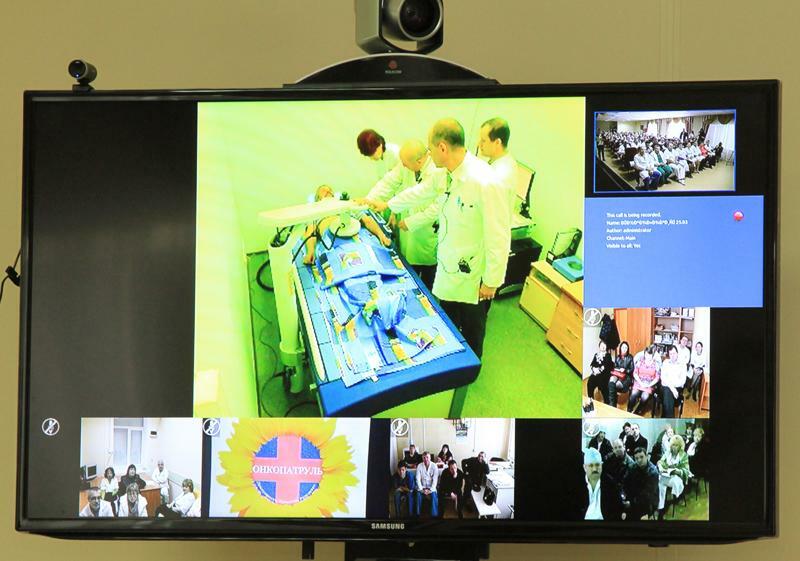 Tele consultations of indicative operations are broadcast from the operating theatre of the dispensary to the entire region with the online participation of doctors from other Kuban’s oncology centres. The specialists of SBHI COD No.1 oncosurgery departments attend Russian and international conferences regularly, undergo training in local and foreign training centres, improve their surgical and professional skills. The Department of Oncology with the course of thoracic surgery and the Department of Radiology of the Ministry of Healthcare of Russia Kuban State Medical University carry out training of highly qualified medical personnel on the basis of the Dispensary. On-the-job training is regularly provided for examination rooms medical workers of the whole region, as well as general medical network doctors.